Thankful for You! 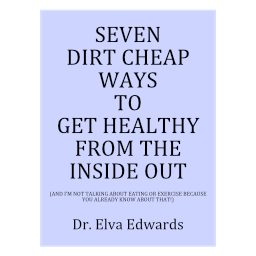 – Dr. Elva Edwards, D.C. I am thankful for you, my patients and friends. I consider it an honor for you to trust me with your body and health. I love what I do. You allow me the opportunity to do what I love to do most. Thank you! The big word these days is inflammation. Everyone wants something for their inflammation. It is wise to clear up inflammation. However, people talk about it as if it is, “the thing.” It isn’t. Inflammation is a response in the body. It is the response to an injury. This is basic physiology. What kind of injury? It can be any kind of injury. I like to talk about it as physical, like spraining an ankle. Or chemical, like eating or drinking something your body really doesn’t like. Or it can be electromagnetic, like holding a cell phone to your head day in and day out. So remember, inflammation is the response. Just treating it isn’t always going to get you to where you want to go. Go upstream to the cause. Are you eating something your body doesn’t like? Are you stressed out with too much screen time or an emotional issue? Or have you sprained your ankle. Always look to the cause of the problem, not the body’s response to the cause!